Office Desk Lamps With USB Charging! Do you ever wander around the house looking for the always elusive charging cable? If you’re like me, my kids love to play hide and seek with every single one in the house. Leaving them nowhere to be found when you really need it! Wouldn’t it be nice to have a spot in your office, or even better yet, at your kids favorite study spot, where the charging capability couldn’t disappear? We have you covered! 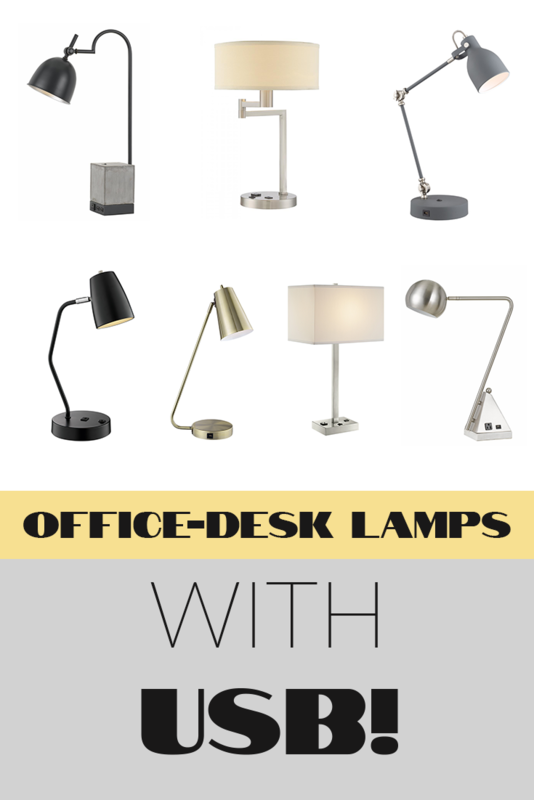 Below is a few of our favorite desk and task lamps that have USB charging capability built right in! Take a look! This gorgeous lamp has a retro modern vibe and would be perfect for that teenager who wants to study in style! Adjustable in two spots with heavy duty knuckle hinges, you can get the light wherever you need it. Features include an on/off rocker switch, 1 – USB port, and uses a standard base light bulb. Go energy efficient by using an LED PAR20 flood light! The Ronnie is a simple compact desk lamp perfect for any desk or study area. This lamp features an adjustable head, an on/off switch, and 1-USB port. Use a 60 watt standard light bulb or an energy efficient LED bulb or flood light. What a sleek beautiful lamp! The antique brass finish with that sweeping stem really creates a designer look. The head of the lamp can be angled to get the light just right. There is an on/off switch as well as 1-USB port on the base. The Quinn is a more traditional style lamp featuring a metal base and a white fabric shade. The amount of light won’t be a problem with the capability of using up to a 100 watt light bulb. The base has an on/off switch, 1 – USB port, and an extra plug for convenience. The Landon is a bit more contemporary in style. The lamp can be slightly adjusted with the pivot point under the shade. An energy efficient 13 watt fluorescent bulb is included with the lamp, providing an abundance of light but not a lot of energy use. The extra plug on the base is a must have and very convenient, as is the 1 – USB port. Delta is a modern design table/desk lamp. Sharp angles are offset by a round head to soften the design. A very useful USB port and outlet are included in the triangular base. Rustic Industrial would be a good way to describe this lamp. The base of the lamp is made of cement creating a very sturdy and stylish anchor. The adjustable head is able to aim wherever you need the light to be. This lamps boasts a convenience outlet, and 2, yes 2 USB ports for charging multiple devices.